Are You Looking for a Daily Bible? 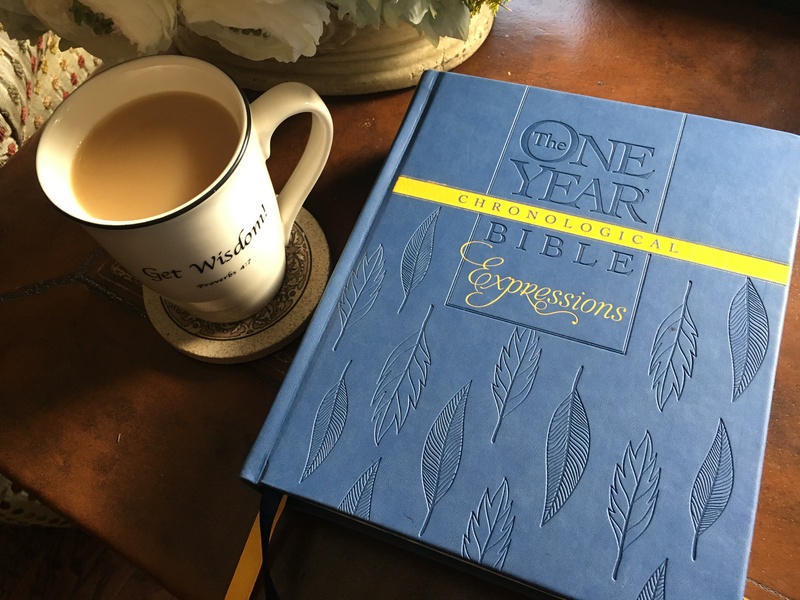 I have tried a lot of daily Bibles over the years, and have never had as much consistency and growth as I have had with The One Year Bible. My method is simple … I read whatever passage is designated for that date AND I NEVER TRY TO MAKE UP DAYS I HAVE MISSED. That was what used to derail me, the trying-to-make-up-days-mistake. Now, if I skip a few days, I just jump right back into the line-up on the exact date. And then I keep going. This is not cheating! Feel free to do it. (All firstborn children out there: I give you permission). I suggest that you find a One Year Bible that you really like, and I LOVE the New Living Translation. I have read through it several years now (skipping days here and there, as I said before) and I am still finding glorious wording and phrases that catch me by surprise and make me think. The NLT is the most readable and comfortable translation, for me anyway. This year, I was shopping for a new daily Bible, since my old one is looking sad and worn out. 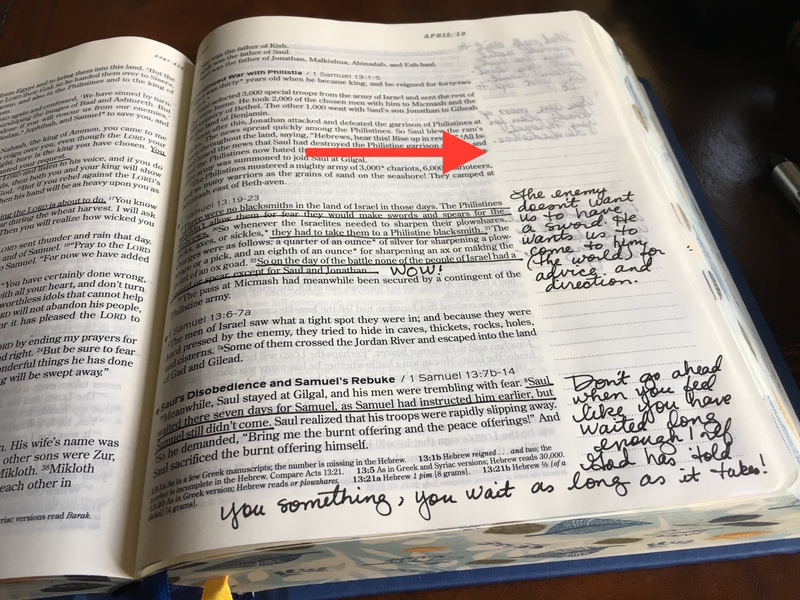 Plus, I wanted to shake things up and get a chronological Bible, because, honestly, the succession of Old Testament events confuses me, and I want to get it straight. 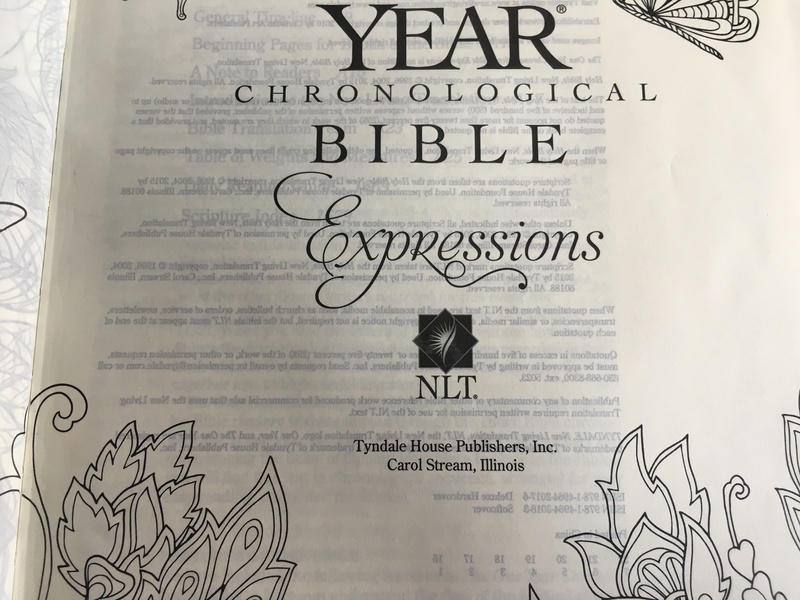 I was browsing online when I came across this new One Year, NLT, wide-margin, chronological Bible, and it is like I hit the jackpot. When I found it, a golden ray of glory shone down on the Amazon page, and I could hear hymns from heaven. I couldn’t believe it was right there in front of me. All the features I need! I bought it right away! 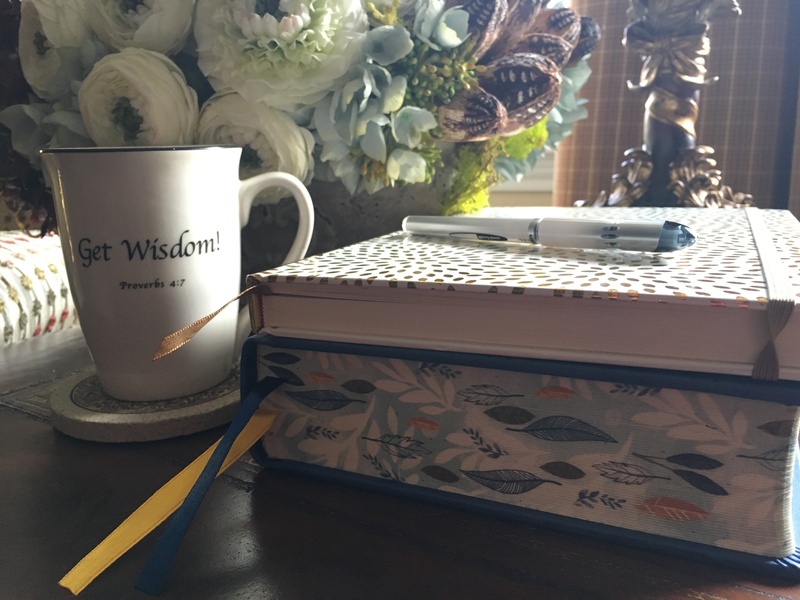 And now every morning, I sit down with my Earl Grey cream tea, and when I open my Bible’s smooth hardback cover, I feel like I am driving a car with voice commands and heated seats and all kinds of luxury whatnot. I had no idea such a Bible existed in real life. Since January 1, I have been in love with it. 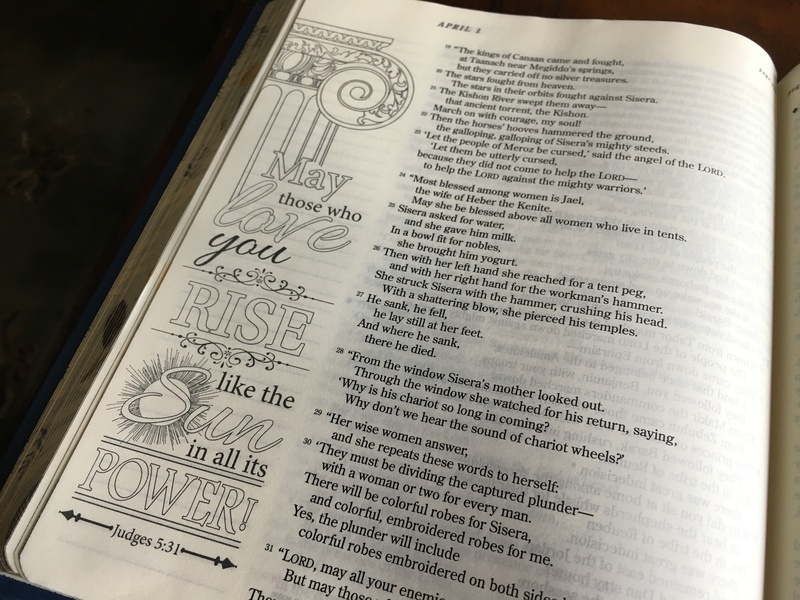 Can you be smitten with a Bible? If so, I am. 1. There are two ribbon bookmarks. TWO! 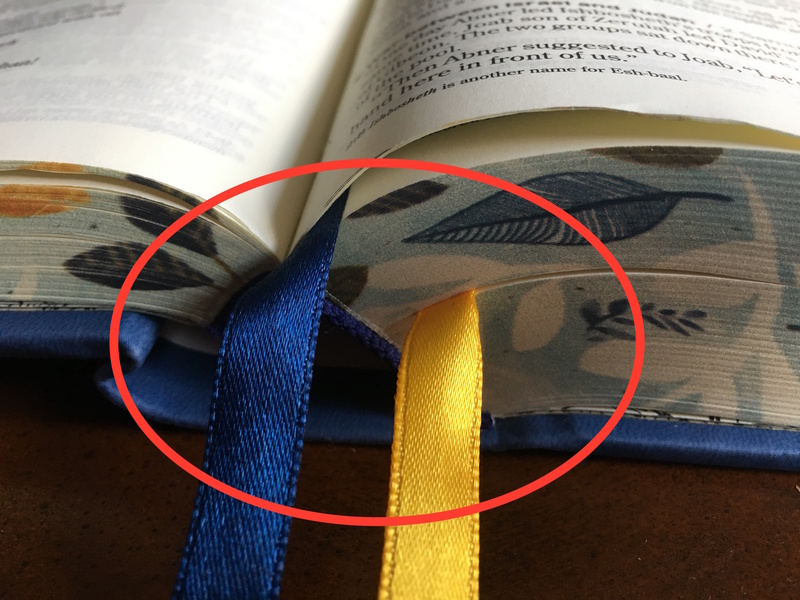 I have dreamed of having two ribbon bookmarks in a Bible. And here they are. And by the way, the printed edges of the pages … I mean, it is a nice detail, don’t you think? 2. 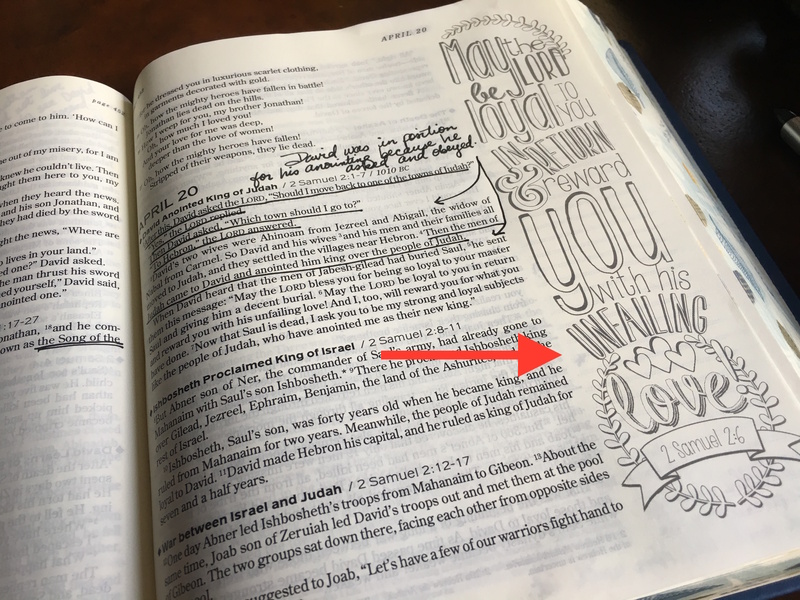 Every once in a while, you get some fancy margin artwork in this Bible. Now, I don’t color these, but I guess you could, if you like. I just appreciate the fun surprise when it comes. They make me smile. I’m so easy to please, it’s embarrassing. 3. When passages are repeated, they are presented together. See? This passage about David’s sons is the same in 2 Samuel and in 1 Chronicles. So they are presented simultaneously. I like this because sometimes there is a slight wording difference between the two accounts, and I can see that immediately. 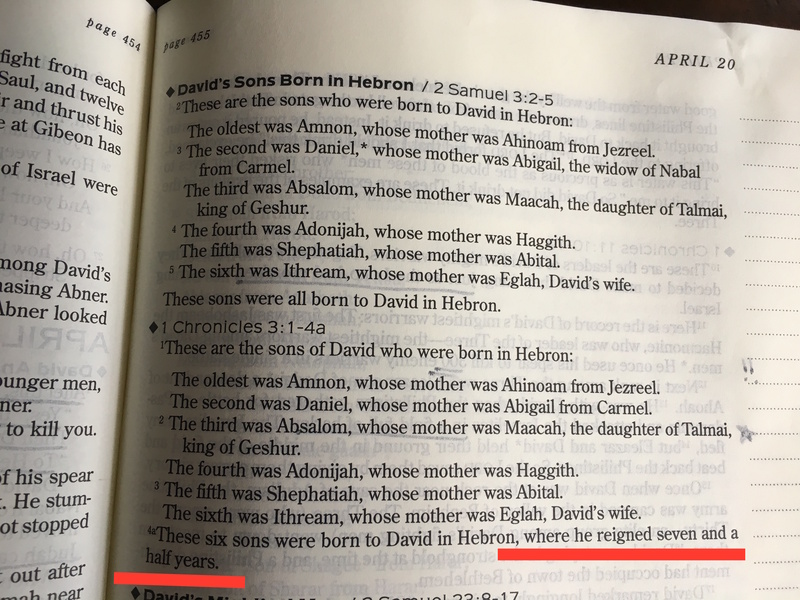 For instance, in this photo, you can see that the 1 Chronicles passage has one extra detail … that David reigned in Hebron for 7 and a half years. 4. When passages are related but not repeated, they are presented together. 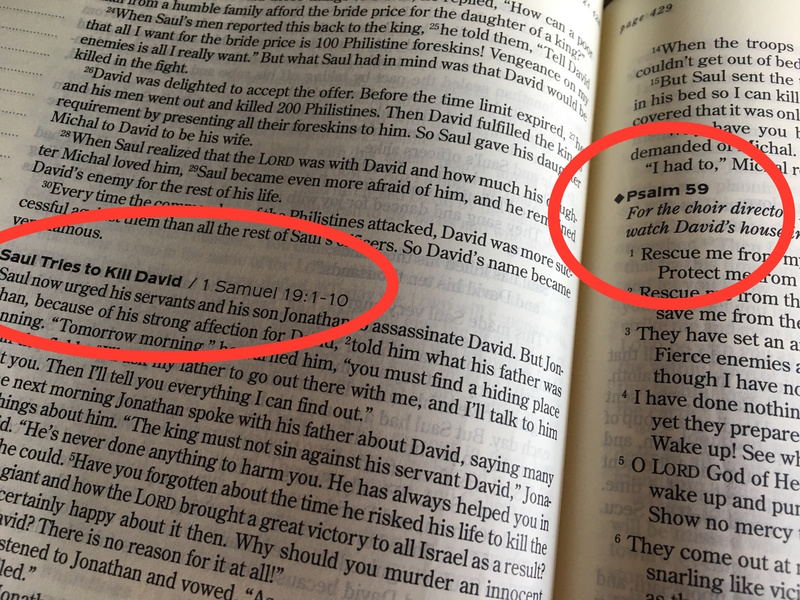 For instance, here, 1 Samuel 19 is about how Saul tries to kill David. And right next to it in the same reading for the day, we get to read Psalm 59, which David wrote when Saul tried to kill him. I like the variety of seeing these passages paired. It makes the stories come alive. 5. The wide margins are my favorite. 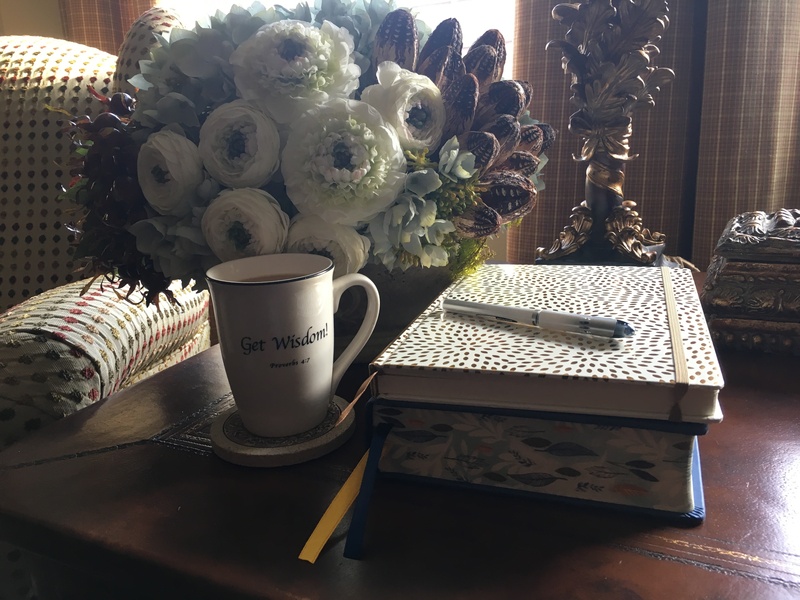 In order to stay engaged, I have to write observations while I read, and this gives me enough room to do it. 6. You are given very brief notes about the chronology. 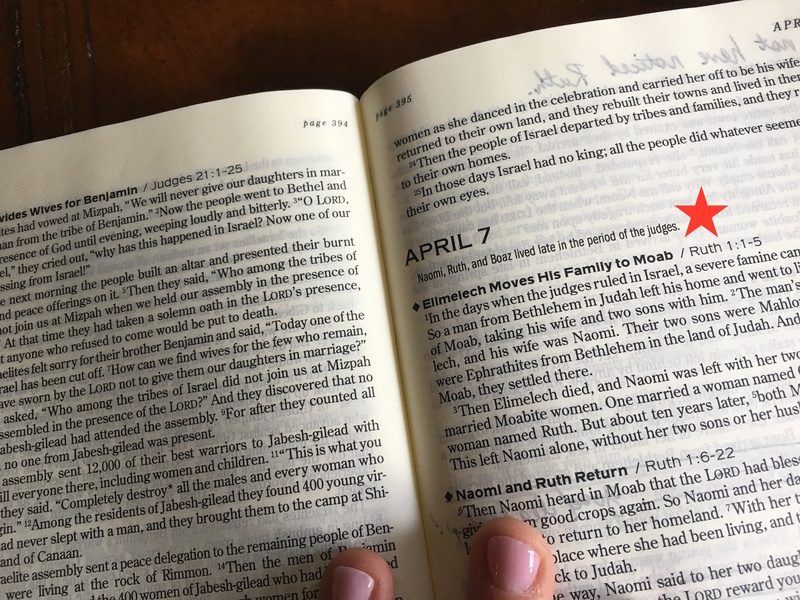 For instance, here you see that the book of Judges ends, and there is one sentence as Ruth opens, explaining that the setting for Ruth is late in the period of the judges. This is the kind of thing that is helping me keep things ordered in my mind. I am happy to recommend this Bible to anyone who is in the market for something new. And yes, I know we are already in May, but all you have to do is turn to today’s date and jump right in. No trying to make up skipped dates from previous weeks. Stop living in the past, friend. You can purchase this Bible in soft cover by clicking here. You can purchase this Bible in hard cover (like mine) by clicking here.